Am I overloading you with brownie recipes? Is there such a thing? Nah! This recipe for Andes Mint Fudge Brownies is a simple way to make minty brownies. The mint is not overwhelming, but adds a lovely, fresh, hint-O-mint. This one pan brownie recipe is perfect anytime of the year for the mint-chocolate loving people in your life. 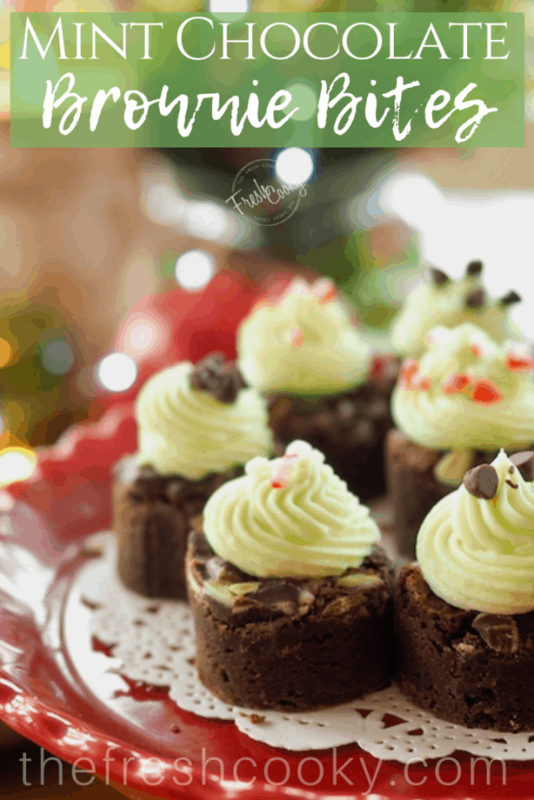 While chocolate is not usually my go-to sweet; weird I know…I do find a chewy, fudgy, gooey brownie terribly hard to resist; make it a mint brownie…drool city! Ready to bake? 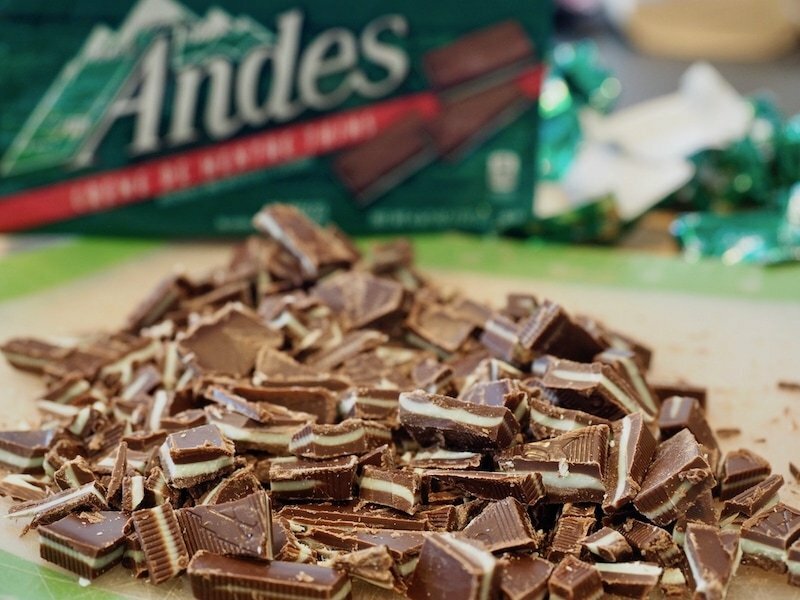 Begin by unwrapping your packages (purchase two) of Andes Mints; chopping the first full package of mints. 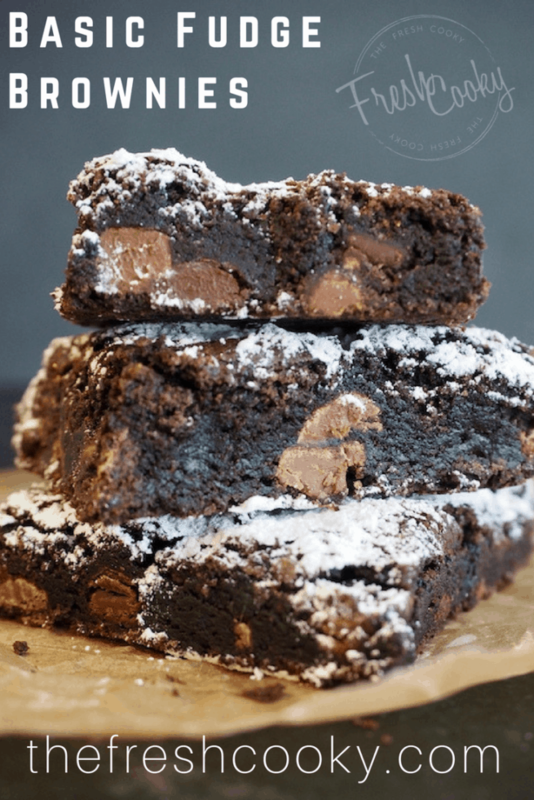 Next we’ll make the batter by making these Basic Fudge Brownies (how-to in the link, but the recipe is provided below). For these mint brownies I did use both dark and regular cocoa powder to enhance the minty-chocolatey-ness. 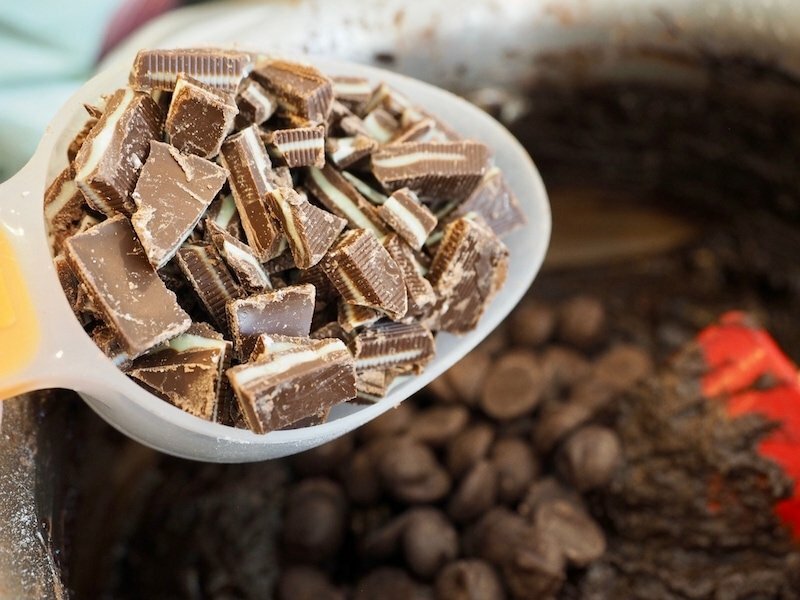 During the mix-in stage (chocolate chips), replace 1/2 cup of chocolate chips with 1 heaping cup of chopped Andes Mints for a total of 1 1/2 cups (1/2 cup chocolate chips, 1 heaping cup Andes mints, chopped), reserving balance of chopped mints for topping. Stir gently to combine and pour into parchment lined, sprayed 13×9″ pan. Spreading the batter evenly to edges of pan, it will be very thick! 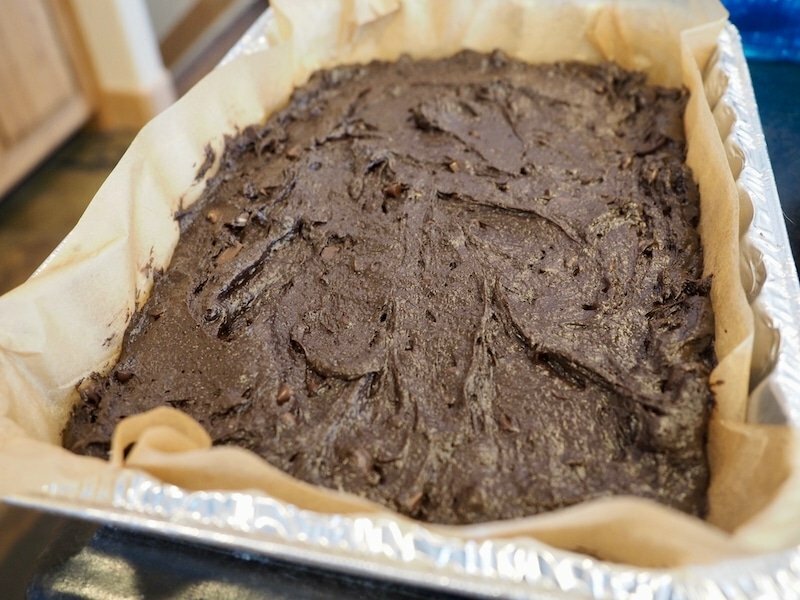 Bake brownies in preheated 350° oven for 25-30 minutes. DO NOT OVERBAKE. Edges will just start pulling away from pan, center will have a dull finish. Once you pull the pan of brownies out of the oven, evenly place the Andes Mints (unwrapped of course) onto the top of the warm brownies. As you can see in the above picture, the heat of the brownies will quickly melt the chocolate. Wait about 5 minutes, then using an [amazon_textlink asin=’B000WG14FC’ text=’offset spatula’ template=’ProductLink’ store=’hefreshcoo0a-20′ marketplace=’US’ link_id=’4c36c099-2e09-11e8-8969-1332b5e425f4′] gently spread the melted Andes Mints creating a dreamy minty chocolate shell on the brownies. 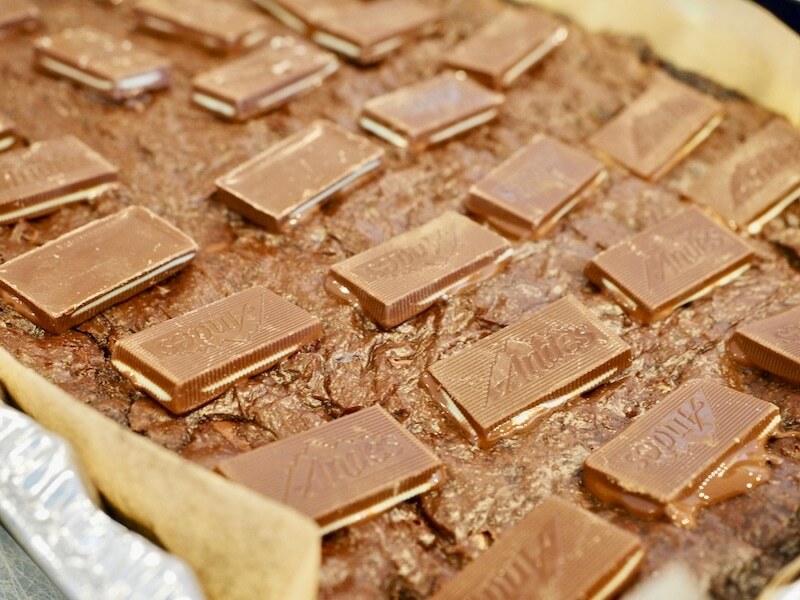 Allow the topping to set up for 20-30 minutes or so, then sprinkle on reserved chopped Andes Mints. 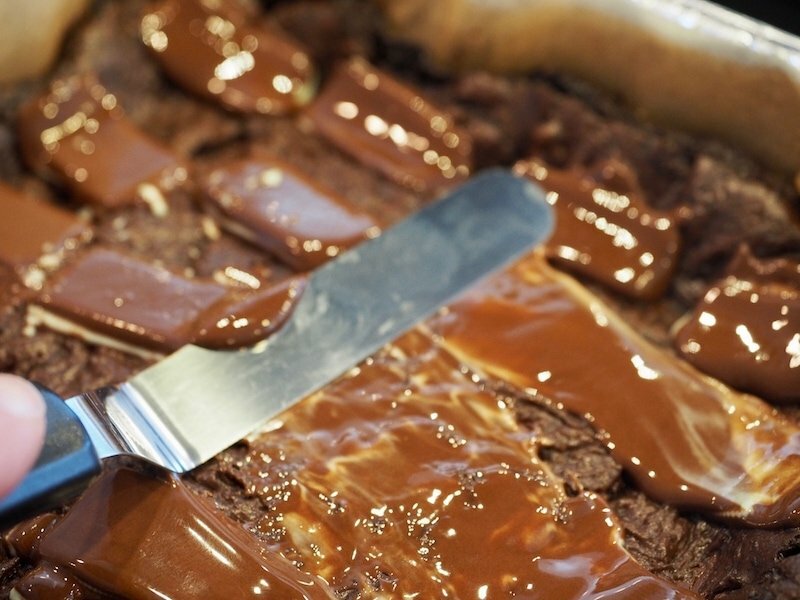 Allow the brownies to cool completely on a cooling rack. To easily to cut brownies, refrigerate brownies for 20-30 or more minutes after cooling completely. Using the parchment paper, remove brownie slab from pan onto a [amazon_textlink asin=’B01MU0C1F5′ text=’large cutting board’ template=’ProductLink’ store=’hefreshcoo0a-20′ marketplace=’US’ link_id=’1baea16c-2e0a-11e8-82ac-238876f35831′] and slice into desired squares. Or using a 1 inch round cookie cutter, cut mini bites from the brownie. Keep the cookie cuts close to each other to minimize waste…but don’t throw away the “guts”; store in fridge or freezer and use on ice cream, for snacking, in lunch boxes. Make up some of my amazing vanilla buttercream frosting, add a teaspoon of mint flavoring (optional) as well as a few drops of of green food gel, not too much you just want to tint it lightly. Place in piping bag and swirl a kiss onto brownie bites, sprinkle with your favorite sprinkles. I used some mini chocolate chips and some crushed peppermint. 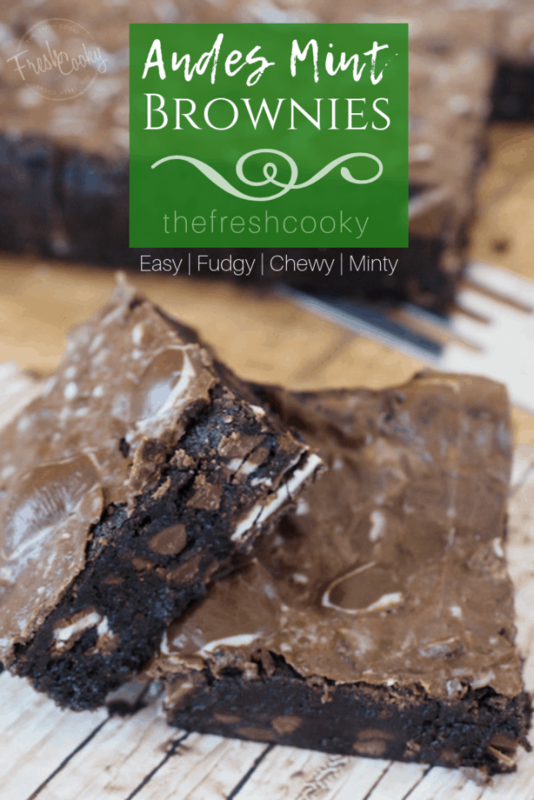 Just look at those beautiful, chewy, fudgy, minty, über chocolatey brownies!! Enjoyed this recipe? Give these recipes a try! This recipe for Andes Mint Fudge Brownies is a simple way to make minty brownies. The mint is not overwhelming, but adds a lovely, fresh, hint-O-mint. This one pan brownie recipe is perfect anytime of the year for the mint-chocolaty loving people in your life. * Reserve balance of chopped mints from package for topping. Preheat oven to 350 degrees and line a 9×13 inch pan with parchment paper, then spray with oil or just spray with oil. Melt butter in medium saucepan, remove from heat. Add sugar, eggs, vanilla, cocoa powder, flour, salt and baking powder, stirring after each addition. Gently stir in chocolate chips and chopped Andes Mints (1 heaping cup). Pour into prepared pan (it will be thick) and bake for 25-30 minutes. Brownies will settle as they cool. Edges should just start pulling away from sides of pan and the center should no longer be glossy. 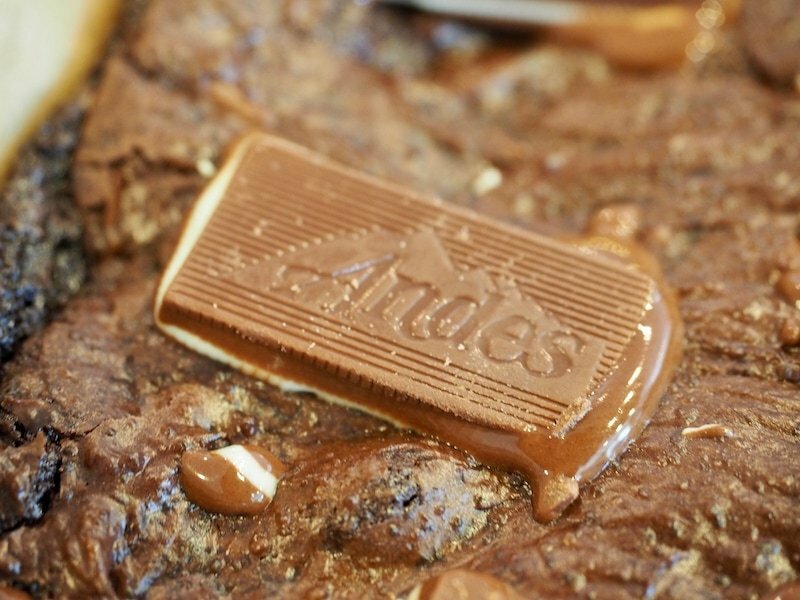 Evenly place entire contents of a box of Andes Mints (unwrapped) on top of warm brownies, allow to melt for 5 minutes. 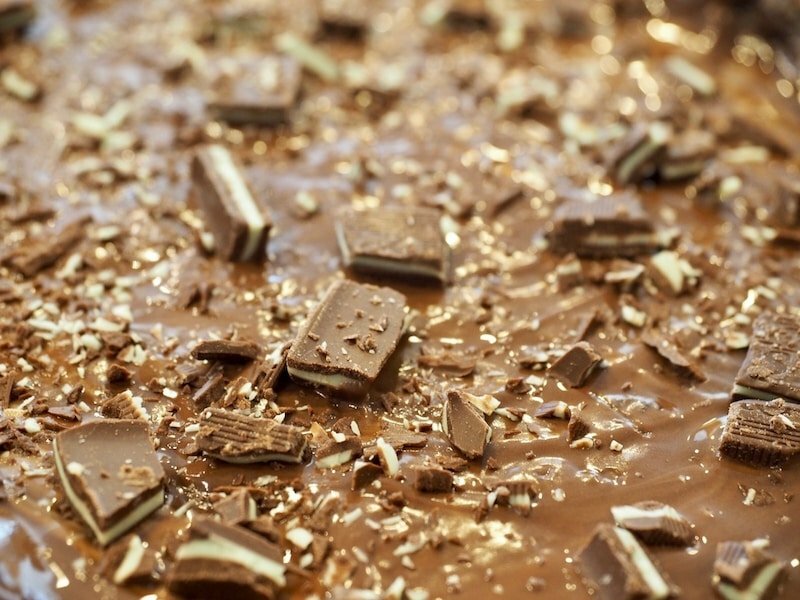 Using an offset spatula, gently spread melted Andes over the top of the brownies creating a minty, chocolate shell. Let set for about 20-30 minutes, then add reserved chopped Andes Mints if desired. I find it easier to refrigerate or freeze for 20 minutes before cutting so the frosting cuts smoothly. Store in airtight container in refrigerator for 1 week or freeze individually wrapped squares for lunch box treats or quick snacks. Allow to come to room temperature prior to eating. Make up some of my amazing vanilla buttercream frosting, add a teaspoon of mint flavoring (optional) as well as a few drops of of green food gel, not too much you just want to tint it lightly. Mix in thoroughly. Place in piping bag and swirl a kiss onto brownie bites and sprinkle with your favorite sprinkles. I used some mini chocolate chips and some crushed peppermint. © 2018 | This recipe for Andes Mint Fudge Brownies was featured first on The Fresh Cooky.